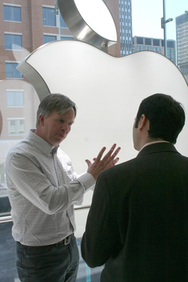 Apple senior vice president of retail Ron Johnson (left) at the opening of the Boston Boylston Street Apple Store. Insofar as Apple has unsung heroes, senior vice president of retail Ron Johnson would likely be one of them. On Tuesday, the Wall Street Journal reported that Johnson will be leaving Apple to take a position as president of department store J.C. Penney, with an eye toward assuming the CEO spot upon the current chief executive’s retirement. Johnson’s loss would be a significant blow to Apple; he reports directly to Apple CEO Steve Jobs and oversees all of the company’s substantial retail efforts. Indeed, Johnson is the force behind the company’s Apple Stores, having joined Apple about a year before they launched; he’s even credited with having conceived the Genius Bar. Apple’s stores have arguably driven much of the success the company has seen in the consumer sector over the last decade; in fact, last month Apple celebrated the tenth anniversary of the launch of its retail venture, revamping some of the store’s offerings. In its most recent quarter, Apple reported it had operated 323 stores, with plans to open another 40 in the current fiscal year. Those stores have seen more than 1 billion visitors in eleven countries, and formed a major cornerstone of sales: In one striking detail, Apple has repeatedly commented that 50 percent of customers who have bought Macs in the stores were new to the Mac. The timing of Johnson’s departure comes in the midst of Apple CEO Steve Jobs’s second medical leave of absence in the last two years. Apple has emphasized the caliber of its top-shelf executive team during Jobs’s absence, and Johnson is certainly a big part of that. Given his key role, however, he could be a hard act to follow. Prior to joining Apple in 2000, Johnson served in a variety of positions at Target, ending as the retail chain’s vice president of merchandising for Target stores. He holds an M.B.A. from Harvard and a bachelor’s degree in Economics from Stanford. Updated at 9:55 a.m. PT with J.C. Penney’s press release.